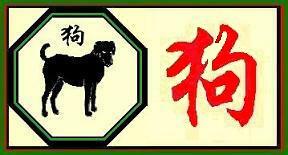 Individuals born in the year of the Chinese Dog are loyal and honest. They have a strong code of ethics. Their downfall is they have difficulty trusting others. They are discreet and make excellent listeners. They get right to the point in conversation. They may be a bit stubborn or narrow minded. The Chinese Dogs is very protective of their loved ones. They rush to the rescue and right wrongs. They can see through the motives of others. They are very private, and tend to get withdrawn if someone tries to pry into their business. Dogs believe in first impressions. They rarely change their minds about anyone once they have decided where you fit. Dogs have no gray, only black and white. They are good judges of character and develop a keen insight. They make friends slowly. They are well-organized and well versed in finances. Chinese Dogs are hard workers but they also know how to relax. They can be playful and often have a terrific sense of humor. They are quick to anger, but also quick to forgive. They are intelligent and stable. You definitely want one around in a crisis. They tend to be rather pessimistic and may be considered nosy. Dogs do better when they can maintain their rationality. Dogs are always helpful to their coworkers and are keen to learn new skills. They are valuable employees. Dogs make great police officers, counselors, politicians, scientists, clerks, nurses and judges. The Chinese Dog is usually healthy, but if they appear depressed or sad, there is definitely something wrong. They fight disease tenaciously, like every other injustice. Dogs are not the most romantic group. They may be insecure in relationships and spend their time worrying. They can be somewhat cold emotionally. Once they find someone they are loyal forever. They will protect their family against all threats. Dogs like to make others happy more than anything else. Dogs are most compatible with Horses and Tigers. They are least compatible with Roosters and Dragons. Different years are assigned different elements, which can affect each sign. The five elements are metal, water, wood, fire and earth. Metal Dogs (1910, 1970, 2030) are committed in everything they do. They have high expectations of themselves and others. Water Dogs (1922, 1982, 2042) are not quite so independent. They like to be part of a group. They are faithful and affectionate. They are very adaptable and relaxed. Wood Dogs (1934, 1994, 2054) like to be part of a group. This helps them have more confidence in themelves. They may be rather shy at first, but eventually warm to people. They are easy going and warm hearted. Fire Dogs (1946, 2006, 2066) are leaders in every sense of the word. They enjoy having lots of friends. They are attractive and charismatic. They are very confident and have a vibrant personality. They like to stay active. Earth Dogs (1958, 2018, 2078) are trustworthy and dependable. They are very good leaders. They keep their heads out of the clouds and see the true picture. They are fair and supportive. Their confidence easily inspires confidence in others.